Festivities at this year’s Pebble Beach Concours d’Elegance kick off this week and there are several treats we will get to see starting off with some performance variations of many popular vehicles. Land Rover will be one to introduce their fastest-ever Range Rovers, the Range Rover Sport SVR with their 5.0-liter supercharged V8 engine and 550 horsepower. The tradition for high-horsepower performance-oriented SUVs has been on the ‘do want’ list for many around the world including here in America. Land Rover plans on capitalizing on that niche among the likings of the Porsche Cayenne Turbo, Mercedes-Benz ML63 AMG and BMW X5M. The Range Rover Sport SVR will mate its snarling supercharged V8 to a re-tuned version of their ZF-sourced 8-speed automatic transmission. 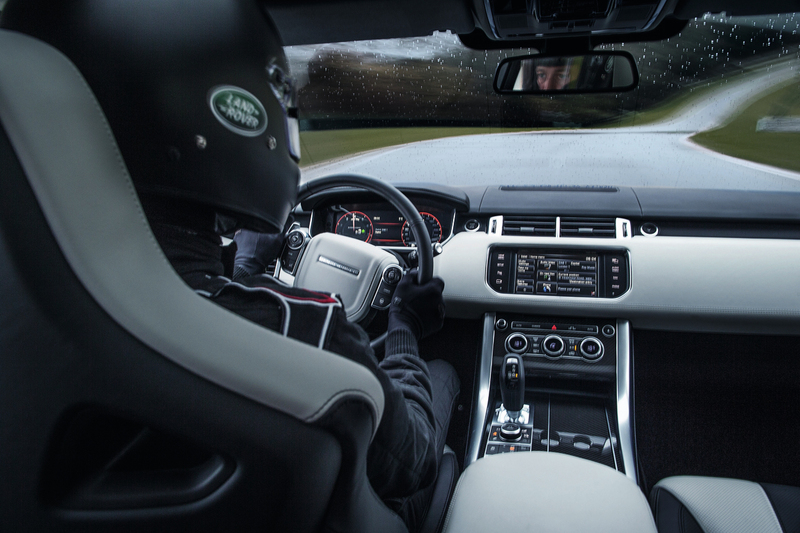 Banging through the quick shifts the Range Rover Sport SVR should reach 60 mph in about 4.5 seconds and afterwards reach its top speed of 162 mph. Of course you can take the Range Rover Sport SVR off-road without any hassles as it will feature full independent, cross-linked air suspension with adaptive dampers and Land Rover’s touted Terrain Response 2 system with 6 settings in addition to an auto mode. In true Luxury-Performance SUV tradition, you will have to pay to play where the Sport SVR will start at a price of $110,475. 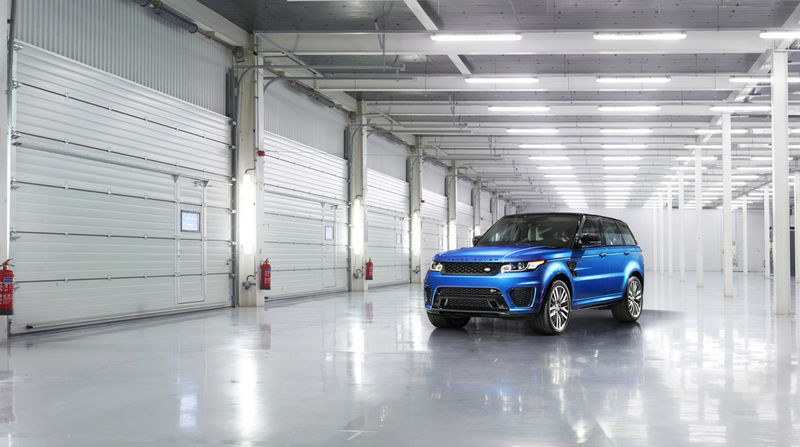 Hit up the full release below for additional information on the 2015 Range Rover Sport SVR. (MAHWAH, N.J.) – August 10, 2014 – Capable of accelerating from 0-60 mph in 4.5 seconds with an electronically limited top track speed of 162 mph, the Range Rover Sport SVR will be the first Land Rover vehicle to wear the new high-performance SVR badge. The SVR features a 5.0-liter supercharged V8 engine which has been developed to produce 550hp and 502lb-ft of torque – a 40hp and 41lb-ft increase over the standard supercharged V8 – while its advanced ZF® 8HP70 eight-speed automatic transmission and four-wheel-drive chassis have been tuned to complement the astonishing performance. Showcasing an electronically controlled two-stage active exhaust, the SVR produces an inspired soundtrack at higher engine speeds while maintaining refinement during steady-state driving. Emphasizing all-terrain capability, vehicles are equipped with 21-inch alloy wheels with 275/45 R21 all-season Continental Cross Contact tires. The exterior design of the SVR makes a visual impact, while functionally boosting cooling and aerodynamic efficiencies. Similarly, a modified interior featuring sport seats provides visual differentiation and offers increased support during spirited driving. Producing a lap time of 8 minutes 14 seconds on Germany’s legendary Nürburgring Nordschleife racetrack, the Range Rover Sport SVR unleashes the full potential of the lightweight and robust all-aluminum architecture, while retaining refinement, luxury and off-road capability. The Range Rover Sport SVR – designed, engineered and built in Britain – amplifies the engineering integrity, robustness and attention to detail that are Land Rover hallmarks. The Range Rover Sport was introduced in 2005, with over 500,000 vehicles built to date. 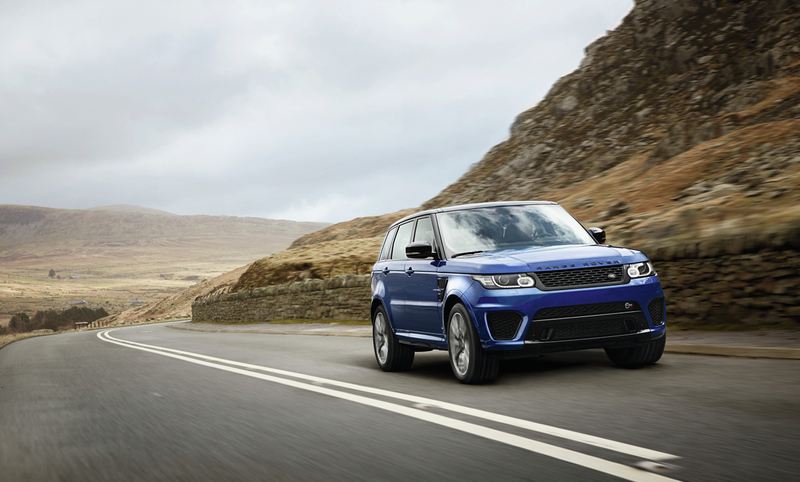 The Range Rover Sport SVR builds on the success of the Range Rover Sport. Its all-aluminum unibody reduces weight by 39 percent compared with its predecessor and provides a strong, stiff and lightweight structure on which to create the Range Rover Sport SVR. The Range Rover Sport SVR was created by the Jaguar Land Rover Special Vehicle Operations team and will be built alongside existing models and sold through the Land Rover retailer network. 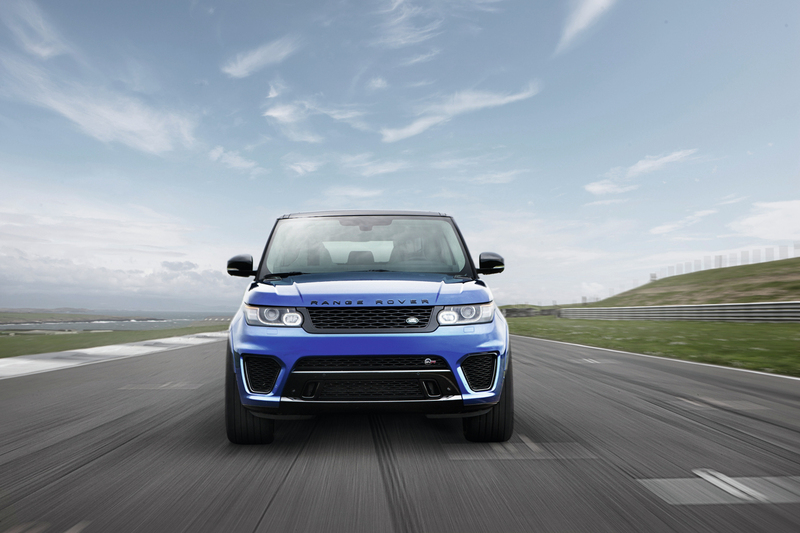 The heart of the Range Rover Sport SVR is an evolution of the JLR all-aluminum 5.0-liter supercharged V8 engine. With cast-iron cylinder liners and cross-bolted main bearing caps, this engine features a combination of strength, performance and refinement. To increase performance, engineers at Special Vehicle Operations have tuned the Bosch management system and increased maximum supercharger boost pressure resulting in power and torque increases of 40hp and 41lb-ft respectively. Producing 550hp and 502lb-ft of torque, the SVR boasts a 0-60 mph time of just 4.5 seconds and an electronically limited top track speed of 162 mph. The Range Rover Sport SVR design enhancements include larger air intakes in the front bumper to increase airflow to two intercoolers that reduce the temperature of pressurized air from the supercharger before it enters the engine. In Dynamic mode, sport driving characteristics are intensified thanks to sharper throttle response and more incisive gearshift logic. In addition, the fuel supply is controlled on deceleration, creating a characterful crackle through the exhaust. The engine’s advanced and highly efficient design characteristics include: low internal friction; high-pressure direct injection with a centrally mounted, multi-hole, spray-guided injection system; dual independent variable camshaft timing (VCT); and an advanced intelligent Stop/Start system that stops the engine instead of idling and instantly restarts it when the driver is read to proceed. The smooth and responsive eight-speed ZF® 8HP70 automatic transmission has been retuned for the available performance. With a sure-footed four-wheel-drive system, the transmission receives additional torque in its lower gears to achieve a thrilling 0-60 mph time of just 4.5 seconds1. Equipped with eight close ratios, shift times have been reduced by up to 50 percent through the implementation of rapid and precise fuel cut-offs during upshifts. This leads to shorter, more visceral and audibly crisper shifts while utilizing engine inertia for a sense of acceleration through the shift. It also creates a more immediate connection to the vehicle, and ensures the engine is constantly within its power band. The transmission’s adaptive shift strategy monitors acceleration and brake inputs, lateral cornering forces, kickdown requests and even the severity of gradients, before choosing one of 25 pre-determined programs to seamlessly adapt to driver behavior and road conditions. Sportier driving triggers more aggressive gearshifts and defers upshifts. To improve dynamic stability, the throttle is automatically blipped during high-speed downshifts, smoothing the transition between ratios. This function also allows the transmission to perform a series of rapid downshifts under hard braking with maximum refinement and control. Corner Recognition maintains one gear through a turn to improve stability while also ensuring a keen response once the bend straightens and the driver can accelerate. Similarly, the transmission recognizes a series of overtaking maneuvers and maintains a lower gear to ensure instant acceleration. Despite this performance focus, there is no impact on refinement: the ZF eight-speed transmission’s torque converter operates for smooth take off in first gear, but is bypassed by a locking clutch from second gear. This creates a direct link between the transmission and the driven wheels. The transmission is controlled via either steering wheel-mounted paddle shift controls, or the gear lever. Drivers can default to full automatic mode, make occasional manual interventions, or push the gear lever to the left to gain manual control. In manual mode, gear shifts are made via the paddle shift controls, or by pushing the gear lever forwards for downshifts and pulling back for upshifts, echoing the shift logic of racing cars. In Dynamic mode, the shift strategy will not upshift at redline and will only downshift to prevent engine speeds below idle speed. 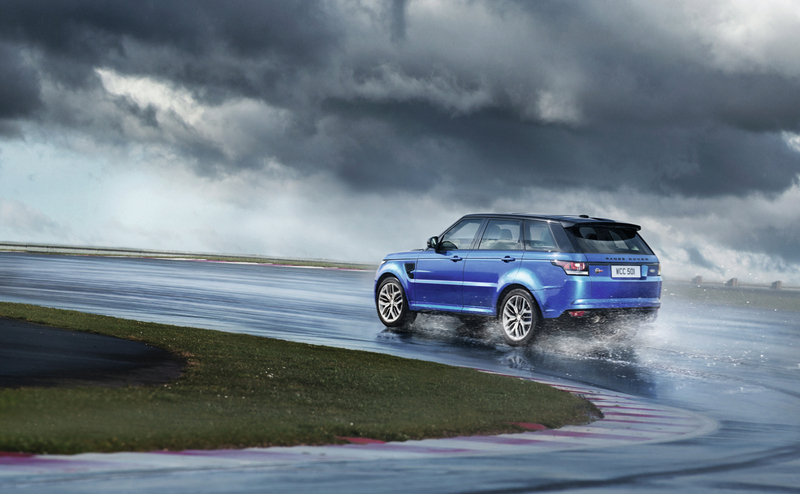 The Range Rover Sport SVR has been engineered to deliver an incredible breadth of capability. The SVR is fitted with permanent four-wheel drive and a two-speed transfer case, with a low-range option for demanding terrain, and a 50/50 percent torque split front-to-rear. Optimum traction is maintained with the aid of an electronically controlled multi-plate clutch in the center differential, which distributes torque between the front and rear axles – up to 100 percent can be channeled to either axle in extreme conditions. Sophisticated electronic traction-control systems further contribute to capability. The transfer case offers selectable low- and high-range, using a two-speed fully synchronized shift on the move’ system which allows the driver to change between the two at up to 37 mph for exceptional flexibility. High-range provides a direct drive ratio of 1:1, while the low-range ratio is 2.93:1, providing an extremely low crawl speed. This allows for an overall crawl ratio of 45.542:1. To optimize traction and stability, the Dynamic Active Rear Locking Differential has been recalibrated. The differential now locks earlier and to an increased extent, satisfying performance-minded drivers and ensuring torque is transferred to the rear wheel with most traction, increasing agility2. Torque Vectoring is also uniquely recalibrated. It uses the car’s brake system to create the effect of a torque-vectoring differential, constantly balancing the distribution of engine torque between the four wheels during cornering, for improved grip and steering, and reduced understeer2. The system monitors the vehicle 100 times per second via the Dynamic Stability Control (DSC) module. As the car accelerates through a corner, the system uses yaw sensors to detect the beginning of understeer. Imperceptible levels of braking are then used to correct the vehicle attitude, while engine torque is transferred to the outside wheels, which have more grip, thus maintaining traction and steering control. The exterior design and luxurious interior of Land Rover’s premium sports SUV have been enhanced for the Range Rover Sport SVR with a range of dynamic improvements. Designed exclusively by Jaguar Land Rover’s Special Vehicle Operations (SVO), the Range Rover Sport SVR makes a strong visual statement. These include a front bumper with muscular trapezoidal air intakes, dark Range Rover script on the clamshell hood, which also features revised vents, and a new grille in a dark finish that contrasts with the headlights’ LED signature lighting. At the side of the vehicle, an all-new fender incorporates a distinctively designed vent, while unique side moldings add muscularity. At the rear, prominent Range Rover Sport SVR badging and a pronounced high-level spoiler with a centrally mounted brake light signal the vehicle’s sporting intent. The unique rear bumper features a gloss black diffuser, which incorporates unique quad exhaust pipes, instantly differentiating this high-performance derivative. The larger air intakes in the front bumper create additional airflow for the charge air coolers that channel air to the powerful 550hp supercharged engine. The new rear spoiler reduces lift, and has been carefully balanced with the new front bumper. Beneath the front bumper a new NVH comb is fitted, which reduces wind noise and improves aerodynamic efficiency. It also reduces front-end lift to help the front tires retain high levels of grip during enthusiastic driving. The deeper front bumper’s more aggressive lower section can also be removed for extreme off-roading. Additional brake cooling has also been introduced for the six-piston Brembo brake set-up, ensuring optimal stopping power. A choice of seven color palettes are available, including the striking Estoril Blue, exclusive to the Range Rover Sport SVR. A Santorini Black contrast roof is available as standard equipment and combines with body-color side moldings to emphasize the muscular stance of the SVR. Exterior trim detailed in Black and headlights with black casings round-off the design enhancements, creating a visually imposing road presence. 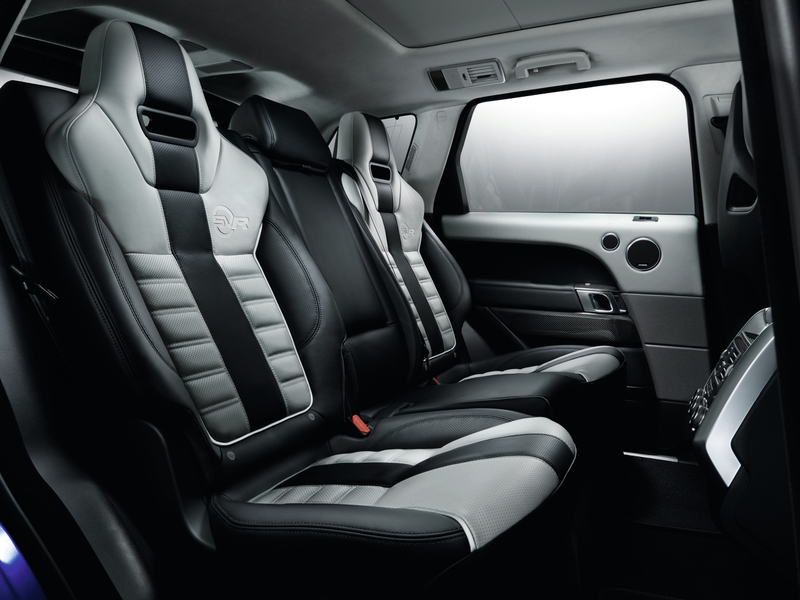 Inside, Jaguar Land Rover’s Special Vehicle Operations has differentiated the SVR with distinctive leather sports seats. These comfortable seats offer additional lateral support during spirited driving. Full 16-way electric adjustment is offered and the vehicle’s Sports Command Driving Position and generous rear legroom are unaffected. The sporting theme continues with the rear seats, which have been redesigned to echo the performance-oriented front seats. The result is an eye-catching four-seat aesthetic, with space for an occasional fifth passenger. The new rear seats recline for maximum comfort and offer full 60/40 folding capability and up to 62.2 cubic feet (1761 liters) of load space. 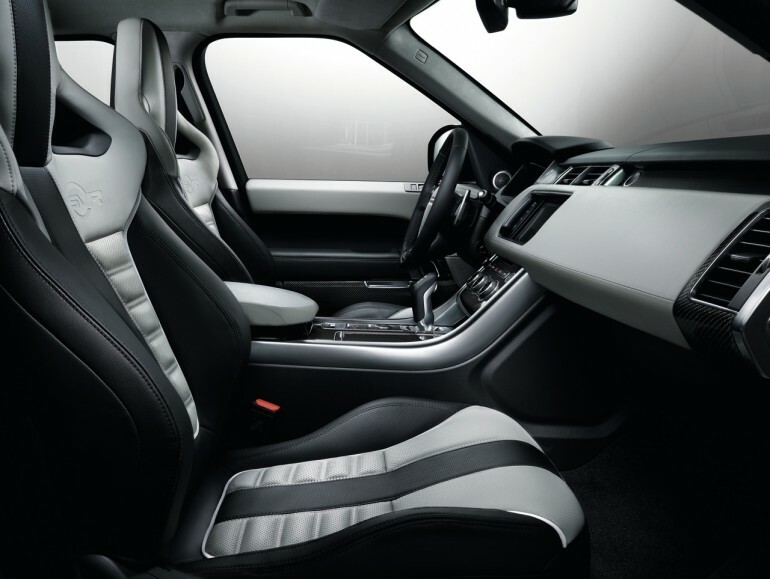 The seats are finished in luxurious Oxford leather with ribbed, quilted centers, Ebony Black top stitching, eye-catching reflective piping, and all feature the Range Rover Sport SVR logo. Four striking interior color options are available: Ebony Black; Ebony Black and Cirrus White; Ebony Black and Pimento Red; Ebony Black and Tan. As standard, the vehicle is supplied with turned aluminum interior trim details, with optional carbon fiber trim for the door panels, center console, dashboard and steering-wheel bezel available. Differentiated by quad exhaust pipes, the Range Rover Sport SVR is equipped with a two-stage active exhaust featuring electronically controlled valves that optimize sound quality, performance and aesthetics. The new exhaust features larger diameter underfloor pipes – up from 2.2-inches (55mm) in the Supercharged V8 to 2.4-inches (60mm) – for enhanced flow characteristics. A new exhaust soundtrack audibly distinguishes the Range Rover Sport SVR, with a purposeful modulation at lighter throttle openings and a higher-frequency staccato at peak performance. The electronically controlled active exhaust valves largely eliminate exhaust flow noise, creating pure engine sound through to peak engine speeds. At lower engine speeds, the electronically controlled valves close off two tailpipes. As engine speed and load increases – typically around 3000rpm – the valves open, allowing greater flow through all four exhaust pipes. A symposer enriches sound quality filtering desirable induction noise into the cabin. Together with modified engine tuning that cuts the air charge far more quickly when the driver lifts off the throttle, the new exhaust also creates a pronounced crackle during deceleration. If desired, the driver can also select a quiet mode at any engine speed. The new active exhaust system has also been designed to maintain the outstanding off-road performance of the Range Rover Sport SVR should owners decide to use its 33.5-inch (850mm) wading capability. The Range Rover Sport has been praised for its high levels of comfort and extremely agile handling. The SVR takes that capability to the next level courtesy of extensive development on British country roads, German autobahns and the Nürburgring Nordschleife. 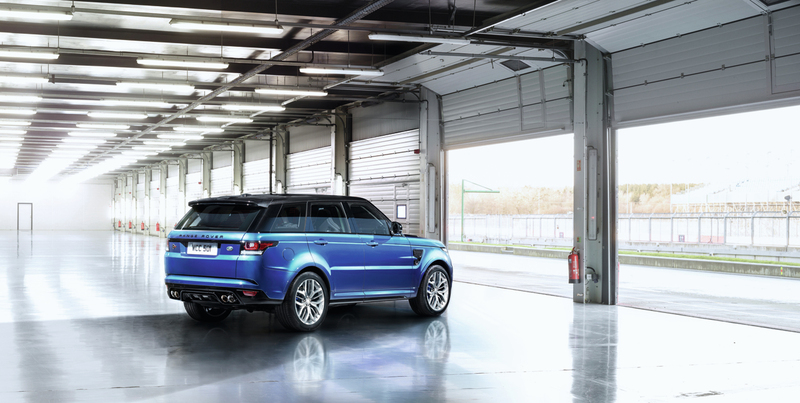 The Range Rover Sport SVR chassis has been tuned for enhanced agility. Constructed mainly from lightweight aluminum components, the suspension is fully independent and double-isolated, with wide-spaced double wishbones at the front and an advanced multi-link layout at the rear. A cross-linked, four-corner air suspension and Adaptive Dynamics with continuously variable magnetorheological dampers is featured in the SVR. Adaptive Dynamics active damping monitors vehicle movements at least 500 times a second, adjusting the damping force almost instantaneously in response to changing road-surface conditions and driver inputs. The air springs feature a modified piston profile for sportier handling and composure, while the Adaptive Dynamics damper settings have been tuned for increased agility. Rear suspension subframe bushings, upgraded by 20 percent, ensure a connected response to driver inputs. While offering a level of performance normally associated with performance cars, the vehicle’s high levels of comfort and off-road capability have not been sacrificed: the ride quality retains its compliance and the ride height is unaltered, with an adjustable range from 2 inches (50mm) in access mode up to 9.3-inches (235mm) for off-roading. Wheel travel also remains identical, with 10.2-inches of movement at the front and 10.7-inches (272mm) at the rear. Wading depth continues to be 33.5-inches (850mm). Six Terrain Response® 2 settings continue to be available: General, Dynamic, Grass/Gravel/Snow, Mud/Ruts, Sand, and Rock Crawl. Alternatively, the “Auto” setting intelligently selects the most appropriate mode. The revised Electric Power-Assisted Steering (EPAS) system featuring variable-ratio, speed-sensitive assistance, with added weighting for a more immediate and connected feel at speed. Unlike hydraulically assisted power-steering systems, EPAS does not rely on an engine-driven pump, reducing fuel consumption and emissions. 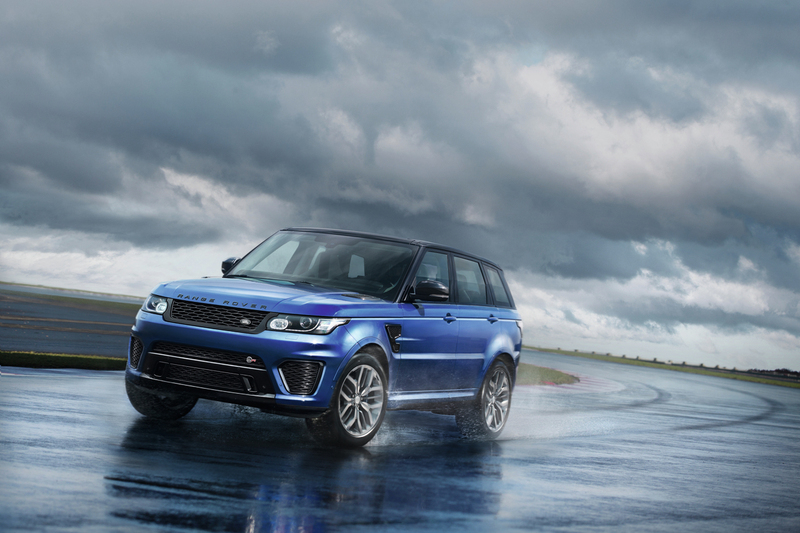 All vehicles will be equipped with Range Rover Sport SVR-specific 21-inch alloys and all-season 275/45 R21 tires. Working in conjunction with air springs and Active Dynamics continuously variable dampers, the two-channel Active-Roll Control (ARC) enhances high-performance capability. Replacing traditional anti-roll bars, ARC employs actuators powered by a hydraulic pump to keep body roll in check, adapting to body accelerations up to 1000 times a second. Compared with earlier iterations with a single actuator, ARC uses two actuators to respond independently to lateral roll at each axle, providing greater precision. When the system senses vehicle roll, ARC applies an opposing torque, keeping the body level and composed. ARC allows the Range Rover Sport SVR to corner flatter and faster. Dynamic mode further reduces body roll for maximum handling capability. While ARC is tuned to behave uniquely for the Range Rover Sport SVR during performance driving, it uses the same software map as other Range Rover Sport models when off-road use is detected by on-board sensors. This maintains excellent off-road capability. With 13 miles (20.8km) of challenging twists and turns, high-speed straights, daunting crests and compressions, the Nordschleife is the ultimate test for any performance car. The SVR was subject to exhaustive testing, with prototype vehicles completing nearly 1000 laps around the legendary circuit. During testing and development, the SVR recorded a Nordschleife lap time of just 8 minutes 14 seconds. The SVR made its dynamic debut at the Goodwood Festival of Speed in the UK, powering up the 1.16-mile course to great fanfare from the motorsports community.